I received an email last week asking me if I wanted to receive product sample. Of course, I said yes! 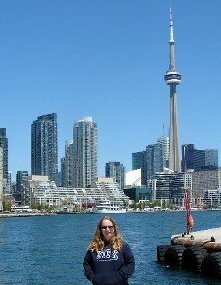 It arrived on Tuesday while I was in Montreal. 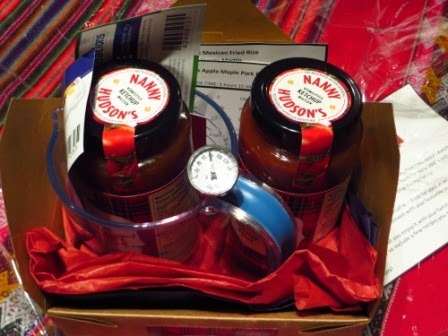 It was a gift box with a couple bottles of Nanny Hudson's Homestyle Ketchup, a large measuring cup and a thermometer. 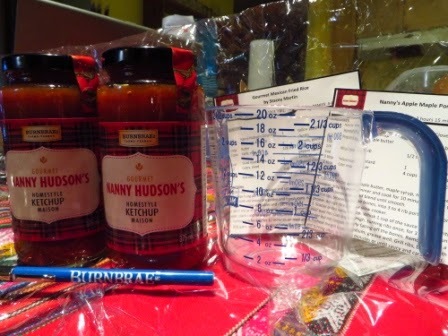 Burnbrae Farms' new product, Nanny Hudson's Homestyle Ketchup, has been a well-loved condiment on the tables of generations of Hudsons. Often referred to as Tomato Butter, we believe the recipe travelled to Canada in the early 1800s with our family's early Scottish settlers. 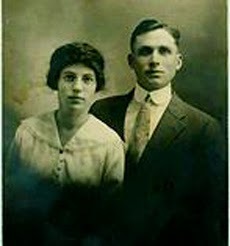 Our grandmother, Evelyn Hudson, whom we all called "Nanny", began preserving tomatoes with vinegar, spices and brown sugar on the farm in the early 1900s when she was a young nineteen year old bride. She met the nutritional needs of her fast growing family by canning the vegetables our grandfather, Arthur Hudson fondly known as Bompi, grew in their large garden. When the fall fruit was plentiful, she canned that too. By the time the autumn leaves fell, her basement shelves were filled to the rafters with quart jars of homemade ketchup, pickles, relishes, apple sauce, vegetables and fruit, enough to last the winter. Nanny taught her three daughters and two daughters-in-law to make their family favourite, Homestyle Ketchup. Many of her sixteen grandchildren enjoyed this preserve and went on to make it for their own families. 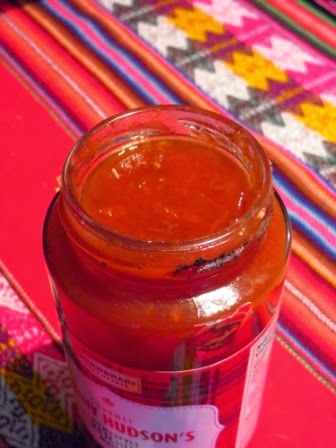 Jars given as gifts have been happily received by friends and relatives who cannot take the time to make this family favourite, termed "red gold" by some. 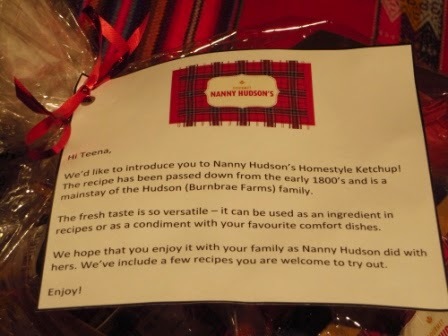 A few years ago, a couple of the Hudson cousins began to inquire why Burnbrae has never considered making available Nanny Hudson's ketchup to all the those who enjoy Burnbrae Farms eggs. Nothing goes better with scrambled eggs and omelettes than a big spoonful of Homestyle Ketchup. Sadly no one listened. 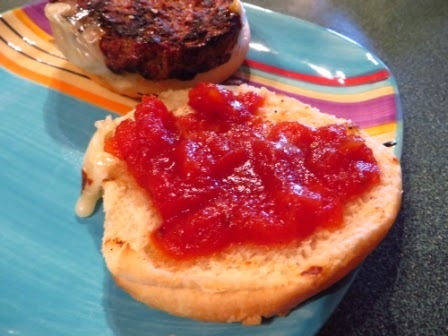 Then, Margaret Hudson, President of Burnbrae Farms, ran out of Homestyle Ketchup and had no time to make it! It is now with enormous pride that we offer you our family's speciality. This preserve, with its beautiful aroma, evokes so many happy memories for us. 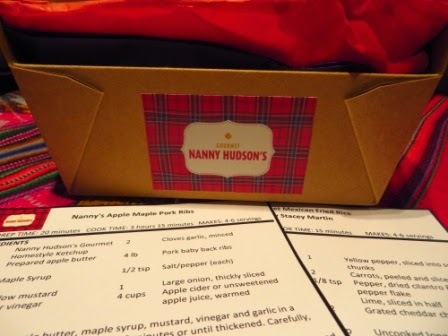 Our Nanny was beloved in the small village of Lyn where many of the children called her Nanny Hudson. We hope that as you savour our product, you share in her warmth and love. 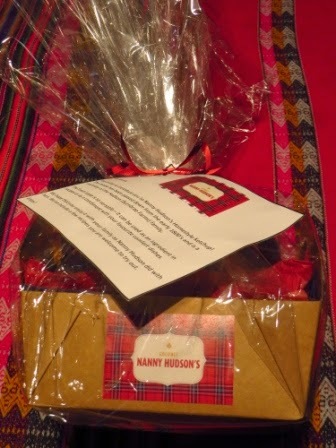 In addition, there are also a couple coupons for a dozen eggs and Egg Creations, and two recipes that sound delicious ... one for Nanny's Apple Maple Pork Ribs and Gourmet Mexican Fried Rice. Can't wait to try the ketchup! September 6 update: I BBQed a burger for lunch today and tried the ketchup. It was chunky, which was fun. It tasted sweet and was delicious! It sounds delicious. I can't wait to hear how you like it.